What did he want? Paul Lerner asked himself. It was a rainy afternoon in January. He was preparing to take his afternoon nap. His wife Sally was off to a meeting of one of the many clubs in their Northern California retirement community. She was five years younger than he was and still active. He’d left all of his clubs except, of course, the New Yorkers. He’d just talked on the phone to their son Jack, who was still going back and forth with the bank about his mortgage. That morning he’d driven in the rain to the dentist. He hated driving in the rain and he hated going to the dentist. Stress, stress, stress. What did he want? When he was a young guy instead of an old geezer he wanted a job, a girl, his own place to live, his own car, his own life. After marrying Sally, he wanted a family, a house, a better job. After retiring, he wanted to travel, to play tennis, to write. Now, at 85, there wasn’t much he wanted. He couldn’t play tennis any more, he didn’t care for more travel, he still wrote his two monthly columns for their senior paper but had grown tired of doing them. What did he want? Maybe it was just tranquility. He fell asleep. “One more thing,” said Paul, “I’m resigning as club President.” It was February. In California it was still raining. The meeting of the officers of the New Yorkers club was about to end and the others were putting together their things and standing up when Paul made this pronouncement. He’d started the New Yorkers club when he and Sally moved to the retirement community and has served as its President ever since. Now there were a few gasps and everyone sat down again. Until then, the meeting had gone as usual. Ken Beerman, the Treasurer, had been late in arriving and didn’t have the latest financial figures. Myra Gershwin, the Secretary, had read the minutes of the last club meeting and pronounced it a success although attendance was down. Also, Ruth Kaufman had reported losing a pair of gloves and would someone go to the clubroom and search for them. Estelle Shapiro, the Program Director, said she was having a hard time coming up with an idea for the next meeting. Beerman had said why didn’t they have a bus trip to San Francisco. Abe Silverman, the club’s Vice President and Paul’s closest friend, said that wasn’t a good idea, too expensive and complicated to arrange. “I think it’s a good move,” said Beerman. “The club needs some new leadership,” by which, Paul knew, he meant himself. “We’d have to have an election at our next meeting,” said Estelle. “Are you sure you want to do this, Paul?” asked Abe Silverman. Sylvia, the veteran waitress came over. “So you’re quitting as the New Yorkers’ president?” she said to Paul. “Thanks, Dad.” It was a warm sunny day in April. Paul had gone for a walk in the nature area. When he got back to the house, knees aching, his son Jack had called with the latest report about his mortgage. Jack had a good job with the State and his wife Trish had a good job with a non-profit agency. Unfortunately, they’d moved up to a larger house in the suburbs during the housing boom. Despite their relatively high combined income they were having a hard time meeting their monthly mortgage payment. They’d managed to get a loan modification, but had a second mortgage they didn’t have the money to pay. According to Jack, the bank refused to come down any lower. And had set a deadline for paying it. It would hurt but Paul said okay, he’d take care of it. “When do you need the money"? As he’d told Abe Silverman, Paul had sold off most of his stocks and put the money in treasury bonds. He’d sell some of the bonds and use the money to pay off the second mortgage. “It’ll be a relief,” said Ken. Paul had advised Ken not to buy the new house but Ken belonged to the generation that wanted, if not instant gratification, then the good things in life without waiting too long. He couldn’t conceive that the housing bubble would burst and leave him, like many others, stranded. That second mortgage had been a concern of Paul’s for the past year. It would cost him a considerable amount of money but he thought it was worth it. One less thing to stress about. Well, no more stressing out about Jack and his mortgage. Too bad Sally had heard about that cruise. There were four stages of travel. First, you went anywhere you wanted on your own. Then you took bus tours. Then you went on cruises. Finally, you stayed home. Paul had reached that final stage, even if Sally hadn’t, and he intended to stay there. “That was a pretty good meeting,” said Sally. “Yeah, Abe handled it well,” said Paul. It was an evening in May. They’d just gotten back from a meeting of the New Yorkers club. It was another potluck, but after eating they’d gone around the room with people saying what they missed most about living in New York. It had brought back a lot of memories. They were in the living room, sitting in their lazy-boy recliners. Sally had turned on the TV and was scrolling through the programs they’d recorded. Paul was looking at the day’s paper. A year ago, he thought, their cat BunBun would be sitting on the footrest of Sally’s chair and their other cat Shandyman would be sitting on the back of his chair, their spots. Bunbun, who’d always been a little sickly, had succumbed to a weak heart, then Shandyman, their healthy cat, had been diagnosed with lymphoma and two months later he too was gone. They’d always been a cat family, which is why, he supposed, their son Jack had adopted one. He and Sally had talked about getting another cat themselves but they’d decided they’d gotten too old to cope with all that demanded. Sally didn’t want to go back to cleaning out a litter box every day. Paul couldn’t picture himself bending down to put cat food in a bowl. It was just as well, Paul thought. Why add another stressful thing to their lives? They settled back to watch their program. He was glad the New Yorker meeting was over and glad he didn’t have to worry about the next one. They had nothing to do the next day. That was the way he liked it. Tranquility. “You’ll never believe it,” said Sally. It was August and hot. 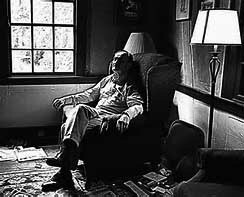 Paul had been doing nothing, just sitting in his recliner with a book on his lap. Sally had just come back from another meeting of the Travel Club. She was excited. “I don’t know. Can we think about it?’ He could already feel the stress building up. Maybe this would be a good time to get away, thought Paul. A week later. Paul had just returned home from visiting Abe Silverman in the hospital. “How’s Abe doing?” asked Sally. After lunch he went to the bedroom for his afternoon nap. Tranquility. Where was it? He lay down on the bed and the kitten, one of the unexpected offspring from Jack’s cat, jumped up and wriggled in beside him. He absently stroked her, then he fell asleep.